Rachel is a WordPress theme that started out as a child theme of Audacity of Tanish, but grew divergent enough that I decided to release it independently. Rachel retains quite a bit of the styling of Audacity of Tanish, with a face-lift via some splendid fonts made available recently by Google. This theme is released under the latest version of the GPL (currently v3), whichever that may be at the time of your use. For the GPL, see: http://www.gnu.org/licenses/gpl.html. You are free to use this theme for any purpose you choose, in a manner that conforms to the GPL. I would like you to leave the attribution at the bottom of the sidebar, but you are not required to do so (and I fully understand if you choose to disable it — in fact, there is a theme Option for that!). Visit the WordPress site for detailed and authoritative instructions on installing themes. For the impatient: it is usually as simple as extracting the archive and copying the directory (“rachel”) into your WordPress installation directory under wp-contents/themes. Versions of this theme lower than 1.0 (e.g: 0.9) are, as the number indicates, alpha releases. They have not been exhaustively tested on all browsers (in particular IE7 and Opera). Please be aware of this if you should choose to use this theme. At the same time, a good bit of testing has been done (and found acceptable by standards!) on Safari 4, Safari 5, Chrome 4 and 5, Firefox 3.6, IE7 and Opera 10.53 (all but IE7 on Mac OS X). I would love to hear from you if you find issues, so that I can fix them ASAP. I really like Rachel, but it seems that Rachel’s sidebar does not like Ozh’s Who Sees Ads. The first ad widget shows in the sidebar, but anything below it ends up behind the sidebar. And the first post appears below that. If you can point me in the right direction, that would be great. It’s a cute theme. Hello Babs, it would help to be able to debug this on the site in question. Do you have the above configuration (Rachel + Who Sees Ads) live somewhere so I can see what’s going on and also look at the HTML/CSS etc. Thank you. Babs, I have a fix! ;-) Please let me know if you want me to send you the modified theme (or you can wait for it to be available for download from my site tomorrow, or from WordPress.org in a few days). Babs, version 0.93 of the theme is now available for download from here or from wordpress.org (http://wordpress.org/extend/themes/rachel) and it fixes (or at least should fix) your problem. Give it a shot! Woot! It works!!!!! Thank you!!! I was a little worried at first, because it seemed the sidebar was stuck “open”, and I couldn’t move my widgets, but after a few refreshes it all worked itself out. It is a terrific theme. Glad to hear of it. Throw some stars my way, if you feel like it, at http://wordpress.org/extend/themes/rachel. Babs, I have a fix I think. I am testing it and will have an update shortly. Hi, thanks for this fantastic theme. Only one question: do you think in next release can be possible change the title from text with a custom jpg or png? I think this the only need i have, rest awesome! Congratulations. 1) if you don’t mind having the image appear below the title, you can create a text widget and add it at the top of the sidebar, and in the text widget you can add the IMG tag to display the image. 2) if you want the image to appear above the title or replace the title, you can go to Dashboard->Appearance->Editor and edit header.php and replace the PHP call for the blog title with an IMG tag. If you decide to go either route and need more help, please do not hesitate to contact me. Hello Thomas, the Meta Widget comes from WordPress and is not part of the theme, so it cannot be modified in the theme. 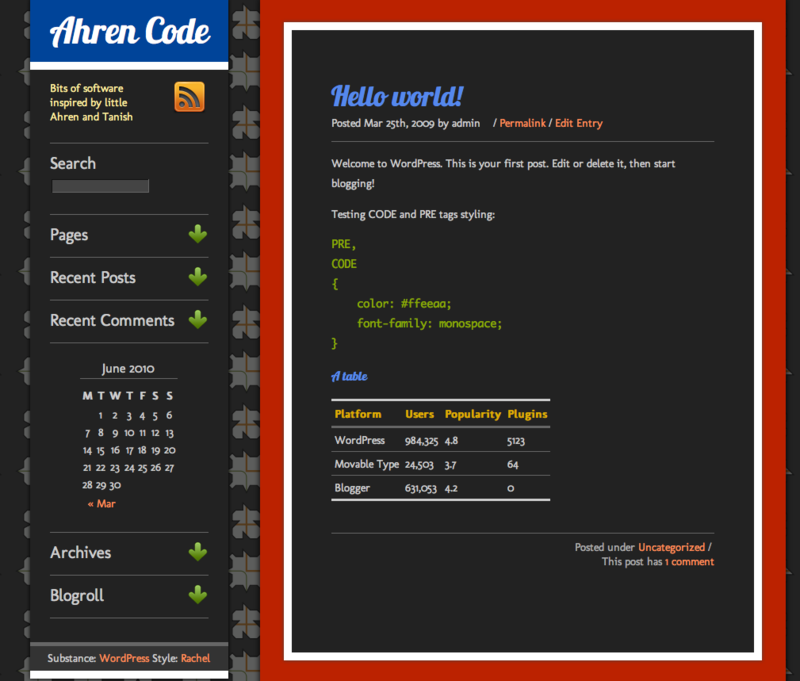 But you can achieve this using one of many WP plugins, such as http://wordpress.org/extend/plugins/customize-meta-widget/. Hope that helps. YOU ROCK!! i love rachel. i love the dark rich colors. i love everything about it. AMAZING job in creating this theme AVI. if i may ask, are there plans to add a sidebar to rachel? and rotomondate-i would love to use that theme for another project but i can’t seem to get it to work. THANKS again AVI for creating rachel. its one of the best looking themes i’ve come acrossed and the reason why i’m using it. come and visit my site and let me know what you think. Hello Vincent, thank you for your comment. Rachel does have a single sidebar on the left — I see it on your site. Am I missing something? It has unfortunately not been updated to offer all the features of WordPress (after WordPress 2.3 or so). If you have any questions about Rachel or Rodomontade, I’d be glad to help.